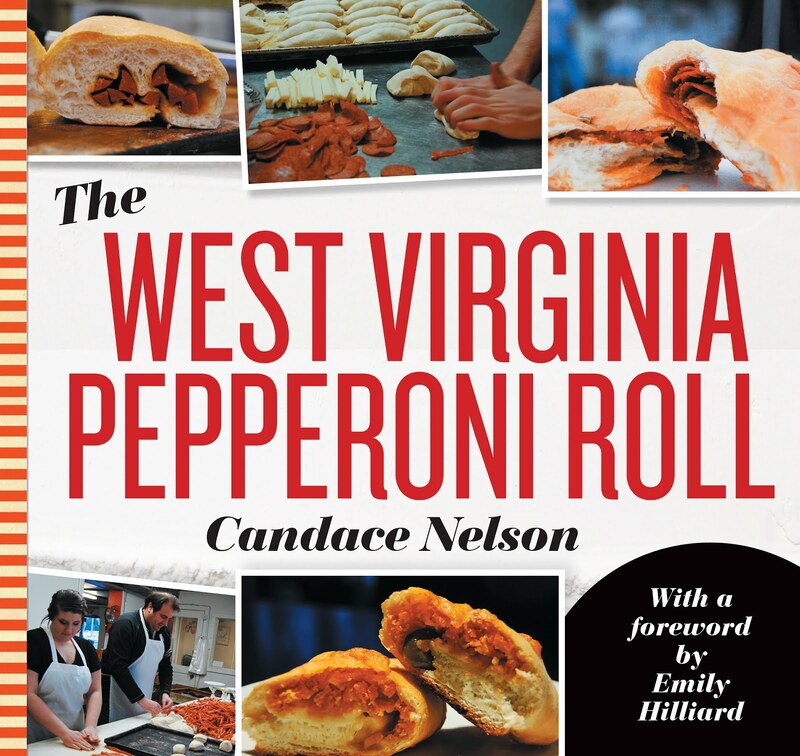 I don't write about dining halls in Morgantown because they're not open to everyone. And that would open this weird door to, what, hospital cafes and things of that nature. However, there has been an increase in private restaurants coming to the various campuses, and those are worthy of a look. Evandale Crossing recently opened on the Evansdale Campus, and it provides this sort of student union space for this campus. It also has six new restaurants as part of the Fresh Hospitality group. There are already two Taziki's in Morgantown: one in the Mountainlair and another in the Suncrest Towne Centre. This is the third, and it's similar to the others. 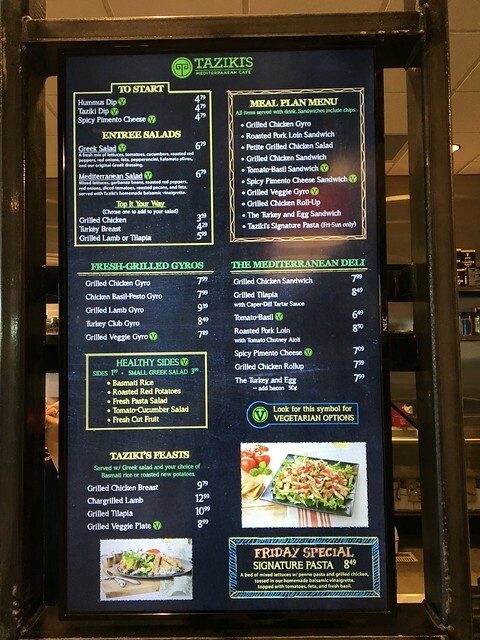 Hummus, greek salads, grilled chicken sandwiches, gyros and my favorites: grilled tilapia sandwich or the Friday pasta special. So, we've covered Mediterranean food and now we're onto tacos. 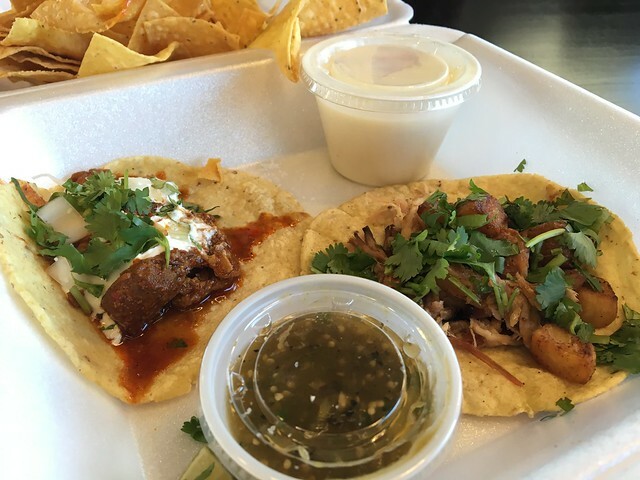 Little Donkey Tacos has a few varieties of tacos to choose from - and they're quite good! I went for the pastor and the adobada - both were very good! 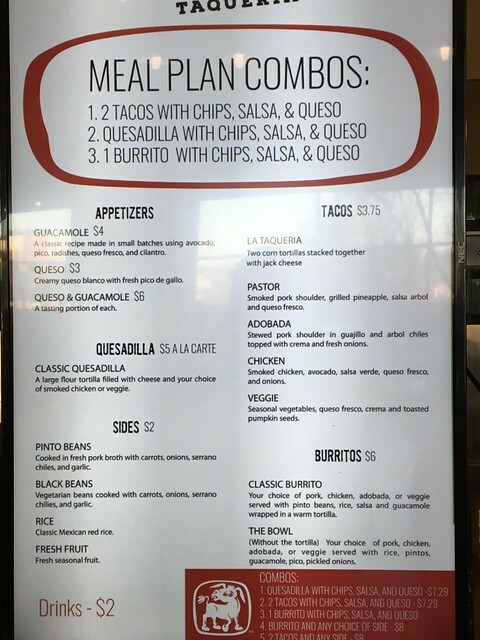 They are a little pricey; it was cheaper for me to get the meal, so I got the queso - and mmm you can't go wrong with queso. Covering all our bases here first with Greek, then tacos and now pizza. 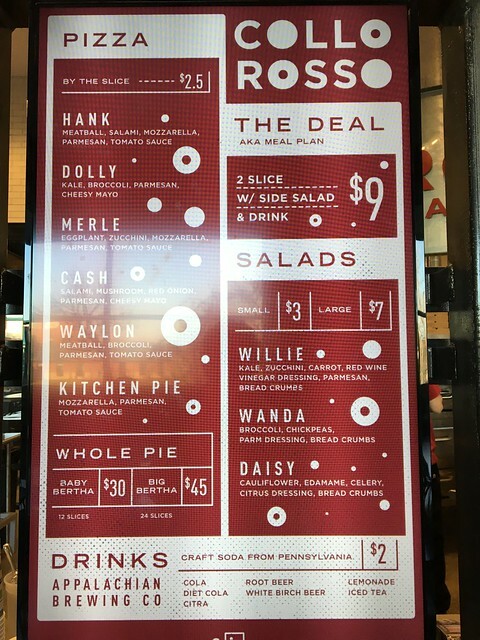 Collo Rosso Pizza has a number of interestingly named slices (or squares, rather) and a couple salads. 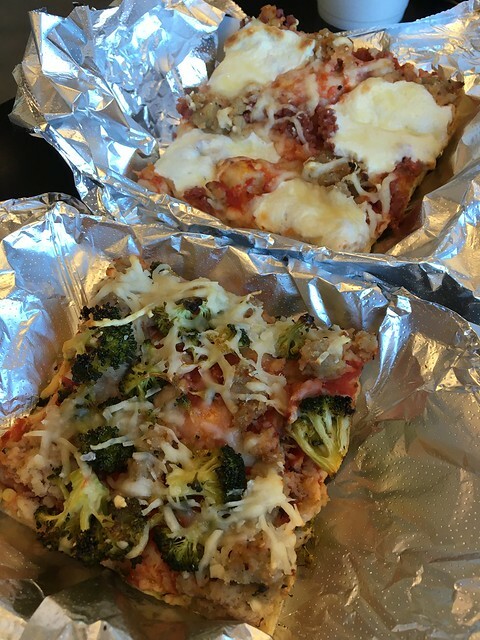 They're interesting combinations - like the Hank, which is meatball, salami, mozzarella, parmesan and tomato sauce. I also got a piece of "Waylon," which is meatball, broccoli, parmesan and tomato sauce. Guess I was jut in the mood for meatball that day. Both not bad. 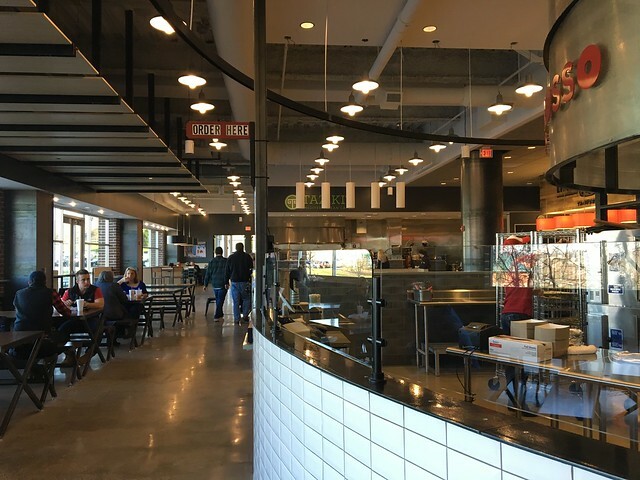 The last stop on the first floor marketplace of Evansdale Crossing is Hugh-Baby's BBQ & Burger Shop. This rounds out the offerings pretty well. 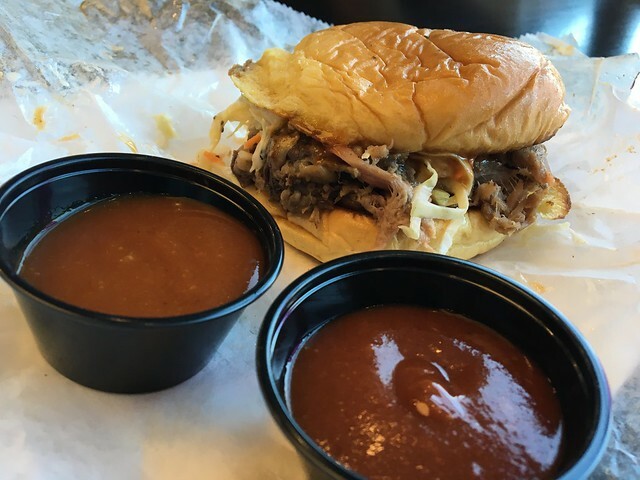 I went for a pulled pork sandwich complete with both their regular and spicier bbq sauce. This was a decent sandwich. Heading upstairs to the lounge area - which has a pretty cool view by the way - finds two more places. 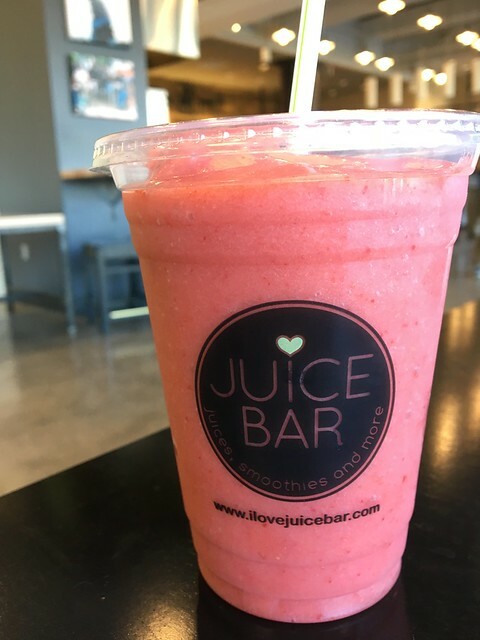 I Love Juice Bar has juices, smoothies and more. I went for the least offensive smoothie to my palate - the very strawberry. And it was quite tasty. My favorite of all may be Octane. 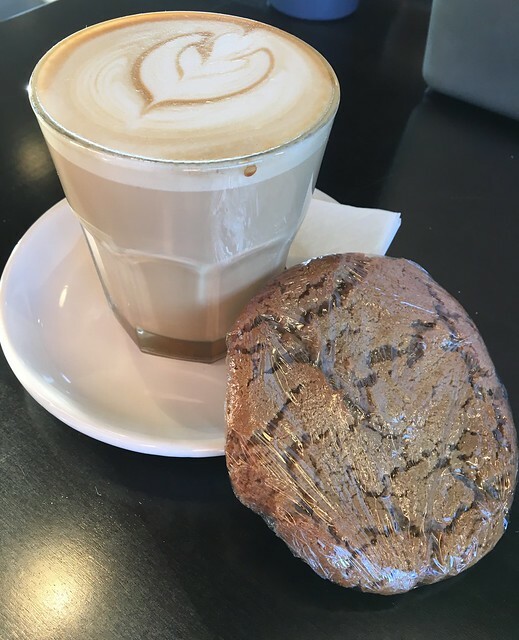 The coffee is tasty - plus they can do latte art - and cookies! What more do you need? Grab a caramellato, a cookie and thank me later.